“California Cuisine.” The words connote Alice Waters salads, alfalfa sprouts and tofu, farm-to-table (better yet foraged) food and Wolfgang Puck-inspired pizzas. But long before Waters or Puck came on the scene Californians had a series of unique dishes that spoke of who, what and where we were: the wild west at the end of the earth. While some of these have disappeared from memory, others such as the Hangtown Fry and Santa Maria Barbeque are as relevant today as they ever were. But no dish says “Barbary Coast” quite as strongly as Cioppino (pronounced “chə-pē’nō”), a rich, tomato-based fish stew that originated as a classic fisherman’s stew similar to its cousins from Mediterranean regions such as Cacciucco or Brodetto from Italy, Bouillabaisse or Bourride from France or Suquet de Peix from Catalonia. It has been said that Cioppino can trace its origins to Genoa on Italy’s Ligurian coast, the town of origin of many of the Italian fisherman who settled in San Francisco’s North Beach district. It would catch on up and down California’s coast. 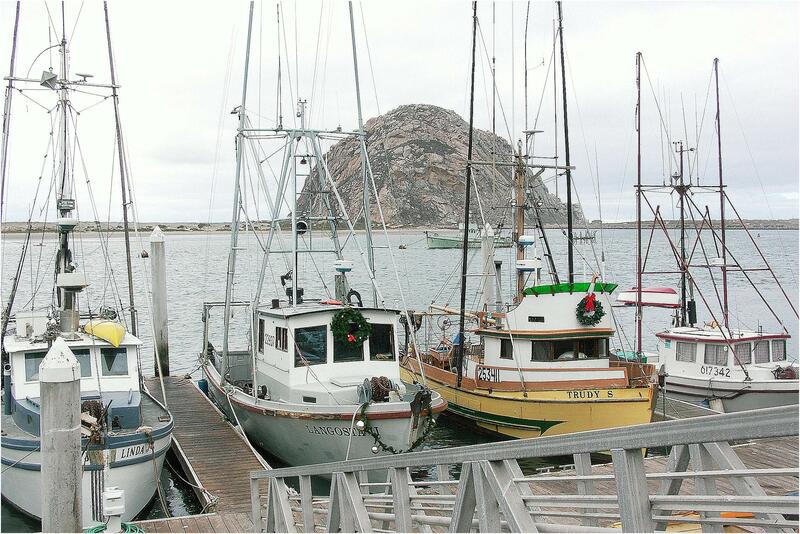 Originally, Cioppino was just a catch-of-the-day stew made on the boats out at sea. The ingredients going into a particular pot of the stew would be determined not by a recipe but by whatever was available. The ingredients for a Cioppino at port would be determined by an additional factor: what did not sell. 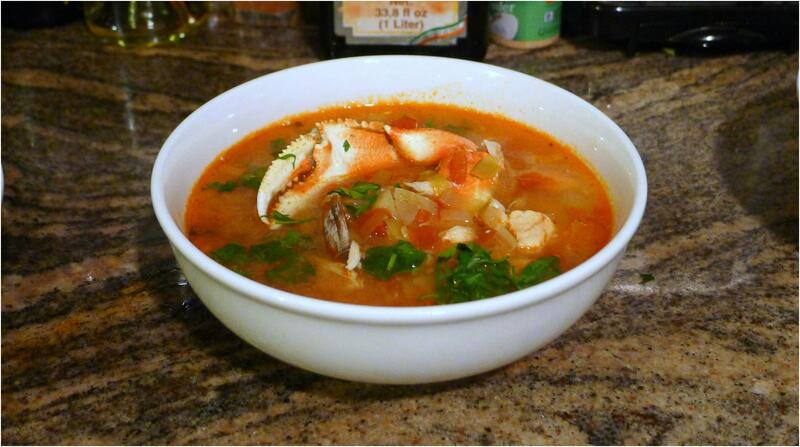 As a result, over time, the ingredients of the classic San Francisco Cioppino tended to include dungeness crab, clams, mussels, shrimp, squid and miscellaneous fish. There are apocryphal stories about the origin of Cioppino that ascribe it not to the fisherman but rather to fishmongers at the market saying “Can you chip in some” fish or shellfish toward a communal meal. The aptly named San Francisco restaurant “Cioppino” is one of the sources of these stories. Various blogs have propagated it. There is, however, no real evidence to support the tale and, frankly, it has no more real romance than the more likely picture of late 19th century fisherman stirring the stewpot on a roiling sea. For me, though, Cioppino brings me back to one restaurant: Tadich Grill. 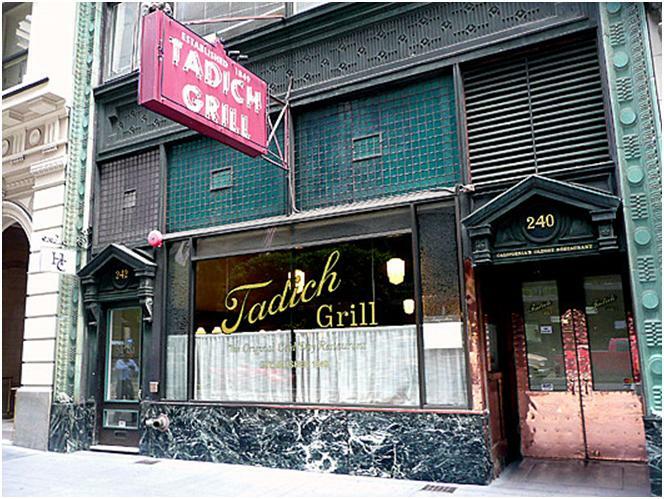 With its long central bar, wood paneling, white coated waiters and gold leaf on the window, Tadich’s speaks of another time and another era. It was, in fact, founded in 1849. I have no idea whether the Tadich I knew in the 1990s was anything like the Tadich of the 1890s but I know it certainly felt as if it did. And if there is one dish that summarized Tadich Grill for me it was Cioppino. 1. Sweat the Aromatics. In a large soup pot sweat the onion, leeks and fennel in the olive oil until soft. 2. Prepare the Crab. Bring a large put to a rolling boil, stirring in the crab boil spices and salt. Add the live crabs to the pot and bring the water back to a boil. Cook for 20 minutes at a rolling boil. Remove the crab from the pot using tongs and place under cold running water until the crab is cool enough to hand. Remove the claws and legs by twisting and pulling gently from the body. Place in a metal strainer. Remove the top shell of the crab by holding the bottom of the crab in one hand and pulling at the base of the top shell with your other hand (use your thumb to get under the shell). Discard the top shell. Pull off and discard the long gill filaments. Rinse the greenish-brown goo out of the bottom shell by running it under cold water. Cut the bottom into quarters with a sharp knife. Place these pieces — along with the legs — in the metal strainer. Using your fingers, pick and push the little pockets of meat from the compartments of the bottom shell. Discard any hard structures. Using a crab cracker (like a nut cracker) or a mallet and small pick (or cocktail) fork, crack the claws and legs and pick out all the tasty meat. The total amount of meat should be about 1/4 the weight of the crab. Alternatively, just buy about a pound of crab meat. It is not quite as good, mind you, but it is a lot less work. 3. Prepare the Shrimp. Peel and de-vein the shrimp, reserving the shells and (if at all possible) heads. Wrap the shells and heads in cheese cloth and tie off the cloth. 4. Build the Flavor Base. Add the tomatoes, stocks, wine, cheese cloth wrapped shrimp shells, garlic, lemon juice, Worcestershire sauce, herbs (except for the parsley), red pepper flakes to the soup pot and bring to a boil. Reduce the heat to low and simmer, uncovered, for 30 to 45 minutes, until the flavors come together. 5. Cook the Stew. Remove the shrimp shells from the stew and add the crab, shrimp and fish. Bring to a boil, then reduce the heat and simmer, uncovered, for another five minutes. Bring the stew back to a boil and add the clams or mussels, cover the pot and simmer for three minutes or until the clams or mussels open. 6. Plate the Dish. Ladle the stew into large bowls,placing one whole claw in shell in each bowl. Garnish with the Italian parsley and serve with Sourdough bread.